Looks like this airline is not gonna last long, too much overcapacity and less demand. Trujet today announced a new non-stop flight from Hyderabad to Kochi from November 20 to January 18, especially for the devotees going to Sabarimala in Kerala. The special flight, targeted at pilgrims visiting Sabarimala which houses the famous hill top temple devoted to Lord Ayyappa in Pathanamthitta district will operate daily. “We are proud to offer Sabarimala special flights between Hyderabad and Kochi. After Tirupati (AP), Shirdi (Maharashtra), Sabarimala is in line with our network strategy of offering smooth connectivity to various pilgrimages. The schedule will ensure optimum utilisation of our guests’ precious time even as they can minimise their hotel costs,” MD of Turbo Megha Airways Pvt Ltd Vankayalapati Umesh said. “We also take care of last mile connectivity by providing Kochi airport-Pamba bus service (on chargeable basis). We hope patrons will avail of this unique schedule in big numbers,” he said. The Kochi airport is located around 190 km from Sabarimala and Pamba is the main halting point on the way to the popular hill shrine, whose main pilgrimage season is from November to January. 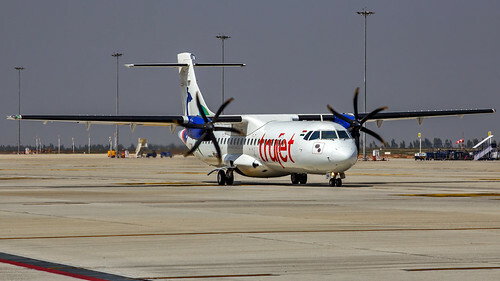 Indian regional carrier TruJet later this week is launching new domestic service on Hyderabad – Kochi sector, which sees the airline operating night-time/red-eye service on this market. From Hyderabad, first flight is scheduled on 20NOV16, using ATR72-500 aircraft. Saw an Ad for new Trujet flights from BLR to RJA and GOI. Horrible timings. Why should anyone choose Trujet, this sector has 6 other nonstop flights at more decent timings. In addition, Trujet is known for its cancellations. Its a Sabarimala season special. They offer a bus service to Sabarimala (on payment basis) as well. It should click if they keep the promise of the connection service. TruJet has added an ATR72-600 to the fleet today, as VT-TMC. Trujet Airways on Wednesday received the Air Operator Certificate (AOC) from India's aviation regulator Director General of Civil Aviation (DGCA) allowing it to expand flight services to all metros in the country, the company said in a statement. It is also the first airline operator in India to be awarded Scheduled Commercial Operator (SCO) permit and can now connect Nanded to Mumbai, Hyderabad to Nanded and Hyderabad to Cuddapah under Ude Desh ka Aam Nagrik (UDAN) scheme. Vankayalapati Umesh, managing director, Turbo Megha Airways, promoter of Trujet, said “We will now connect the underserved cities with the big metros and contribute towards the overall economic growth. We are very hopeful that the response will exceed our expectations”. Has Trujet cut down services to BLR? Their GOI and RJA flights have been regularly cancelled for the last few days. TrueJet will acquire two ATR 72-500 and one ATR 72-600 aircraft in the coming month to expand its fleet to seven ATR aircraft. Under UDAN, the company has obtained licence to operate in 18 routes providing the opportunity to expand its operations across India by adding routes such as Bidar, Mysore, Salem, Hosur and Vidyanagar. It currently operates four ATR72-600 aircraft with the fifth aircraft about to be added to its fleet by the first week of September. By the 2019, the company will have 15 aircraft in its fleet. I had feared the worst for this airline. Looks like they are doing ok. Touchwood! But going from 5 to 15 planes in little more than a year is an overkill methinks. I hope they have got their plans in place. Would be sad if they went the Air Costa way. I flew them recently from HYD to Tirupati and back, and they were nearly full both way. Prices were lower than Spicejet and Air India and but not that cheap. They do offer a snack on the plane. Still going from 5 to 15 is a concern as some of the routes may not have much traffic. For example on the same day I went to Tirupati they cancelled the HYD to RJA flight. TruJet has added an ATR72-600 to the fleet today, as VT-CMP. Trujet is all set fly a new service from Chennai to Selam on March 25. It will be expanding its services to another couple of months from Ahamedabad and Guwahati. Trujet got permission to fly on 20 routes additionally to operate from Ahmadabad to Porbandar, Jaisalmer, Nasik, Jalagaon; Guwahati to Kuchbihar, Buranpur, Teju, Tejpur etc. Trujet is planning to add seven more aircraft. TruJet Chief Financial Officer, KG Vishwanath says the Indian regional specialist will wet-lease seven additional ATR turboprops by March 2019. TruJet currently operates three ATR72-500s and two -600s on scheduled flights to 14 cities across India's central and southern regions. Speaking to The Hindu newspaper, Vishwanath said the use of wet-lease aircraft would allow TruJet to more rapidly expand its network. He did not specify from whom the aircraft, presumed ATR72s, would be leased but TruJet has been linked to talks with Jet Airways over its use of their unwanted Avions de Transport Régional fleet. Only regional ( now commuter airline ) in operation , completed all UDAN one Route ( first airline to complete same ) .. other four regional airline either closed or stopped operation in same period …. good turn around with stabilized operation …. Jet Airways is in advanced stage of discussions with TruJet to sublease up to seven of its ATR planes to the regional carrier as it seeks to reduce costs and mop up additional revenues amid cash drought, according to an industry source. These planes are likely to be subleased with its complete crew, maintenance and insurance. The Naresh Goyal promoted full service carrier currently has 15 ATRs in its fleet. TruJet, which started operations in July 2015 has an all ATR fleet. The deal may be stitched by this month, the source privy to the development said. 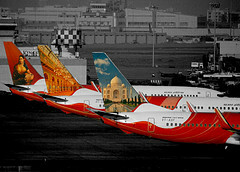 The Mumbai based carrier had attempted to phase out these regional jets in the past as well. "Both Jet Airways and TruJet are in the advanced stage of negotiations on the ATR deal. As per the on-going discussions, TruJet will initially lease seven ATRs from Jet Airways," the source said. While TruJet confirmed its discussions with Jet Airways, the latter said that "it continues to evaluate all possible alternatives". The source said that the sublease period was likely to be for five years, and under a wet lease arrangement, adding, "If the deal gets through, TruJet could opt for more such planes from the airline." "We are working options to induct up to seven aircraft for short period from Jet Airways," a TruJet spokesperson said. The Hyderabad based airline had last month said it plans to acquire five to seven ATRs and expand the network to 20 more routes by the end of FY19. The carrier currently has five ATR-72s and connects 14 destinations including some under the Centre's regional connectivity scheme, Udan. “Jet Airways continues to evaluate all possible alternatives to ensure optimum utilisation of its fleet," a Jet Airways spokesperson said. "Owing to our quiet period, we're unable to respond to further specific queries," the spokesperson added. Jet Airways’ plans to lease up to seven of its regional jets to TruJet has hit air pocket due to regulatory issues and pilots’ problems, a source has said. The two carriers had attempted to stitch a deal on ATR planes earlier last year as well, but even after months of bak and forth, Jet Airways failed to phase them out. “The plan to wet lease up to seven ATRs from Jet Airways is on hold as of now. If it comes back to the negotiation tables at all, it will be only next year,” an industry source told PTI. “Jet Airways is not in a position to provide adequate number of ATR pilots along with the aircraft as a number of pilots have quit the carrier in the recent past. Instead, it wants TruJet to dry lease these planes, which is an economically viable proposition for the regional carrier,” the source said. “Leasing in an ATR from the market is not an issue but getting trained pilots for this type of aircraft is certainly a problem. So, a dry lease does not make economic sense at all,” the source said. The source also said that TruJet will have to make an upfront payment of over Rs 35 crore to Jet Airways towards the “advance” lease rentals, adding that the full-service carrier is also facing certain regulatory approvals in wet leasing its planes. “However, considering the deteriorating financial health of the carrier, certain apprehensions around its future remain. This is another reason for deferring the deal at this stage,” as per the source. A TrueJet spokesperson had in August old PTI that the carrier was working on options to induct up to seven aircraft from Jet Airways. TruJet had earlier said that it is planning to acquire five to seven ATRs and expand the network to 20 more routes by the end of FY19.